Bidirectional maps may have associated information about each relation. Suppose we want to represent a books and author bidirectional map. Books name are unique identifiers, so we can create a separate std::map< string, string > that relates books names with abstracts. We can use Boost.MultiIndex for the new beast. Option 1 is the wrong approach, if we go this path we lost what bimap has won us. We now have to maintain the logic of two interdependent containers, there is an extra string stored for each book name, and the performance will be worse. This is far away from being a good solution. Option 2 is correct. We start thinking books as entries in a table. So it makes sense to start using Boost.MultiIndex. We can then add the year of publication, the price, etc... and we can index this new items too. So Boost.MultiIndex is a sound solution for our problem. The thing is that there are cases where we want to maintain bimap semantics (use at() to find an author given a book name and the other way around) and add information about the relations that we are sure we will not want to index later (like the abstracts). Option 1 is not possible, option 2 neither. Boost.Bimap provides support for this kind of situations by means of an embedded information member. 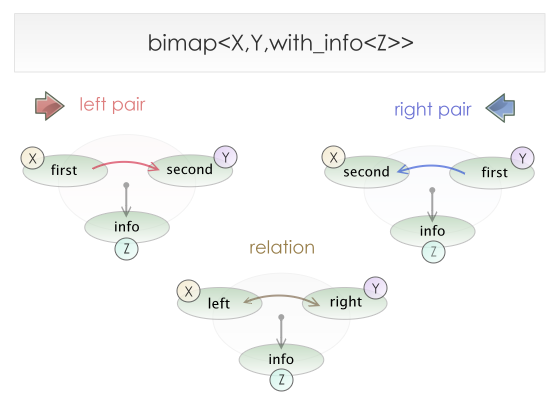 You can pass an extra parameter to a bimap: with_info< InfoType > and an info member of type InfoType will appear in the relation and bimap pairs. Relations and bimap pairs constructors will take an extra argument. If only two arguments are used, the information will be initialized with their default constructor. "For C++ old-timers, the first edition of this book is"
Contrary to the two key types, the information will be mutable using iterators. A new function is included in unique map views: info_at(key), that mimics the standard at(key) function but returned the associated information instead of the data.